To be honest, my initial expectations weren’t very high for Thomas Hardy’s classic novel Far from the Madding Crowd. All I knew about it before opening the first page was that it’s often hailed as an “epic” love story. My track record with love stories has been hit or miss at best (anyone else feel lukewarm about Romeo and Juliet? ), so it was no surprise that I felt a bit hesitant about this story. My wishy-washy attitude towards it probably explains why it’s been sitting on my bookshelf for months, untouched. Oh, Holly of the past, why do you do this? Far from the Madding Crowd far surpassed every initial expectation I possessed, leaving my doubts in the dust wondering why on Earth I didn’t pick up this book sooner. This novel has numerous strengths, but for the sake of time I’ll limit my discussion to only a handful: complex characters, the story’s depth beyond that of “just” a love story, Hardy’s writing style, and the novel’s ability to be so emotionally gripping. First, let me frankly say that I didn’t really care for the character of Bathsheba Everdene. While I admire her independence, work ethic, and determination, it’s clear that she dug herself into many holes due to her stubbornness, impulsiveness, and a foolhardy desire to maintain an unprecedented level of pride. Her inability to step back and view the bigger picture time and time again frustrated my inner realist to no end. But here’s the strange thing: I didn’t really mind. Usually when I dislike a main character it tends to taint the rest of the book for me; however, I felt as though it was partly intended for the reader to have mixed feelings toward Bathsheba. In this way, I’m reminded of F. Scott Fitzgerald’s The Great Gatsby. Daisy and Tom and even Gatsby are not necessarily the most moral or thoughtful people (actually, they’re quite easy to dislike), yet I think that’s the point. For me, the most redeeming character in Far from the Madding Crowd is Gabriel Oak, the poor farmer who is the first man we see fall in love with the headstrong Bathsheba. Oak was like a breath of fresh air in a hot, stuffy room. His common sense, strong morals, and kind heart were sorely needed in the midst of everyone else’s ridiculousness. Without Oak’s grounding good nature, it’s safe to say that my opinion of this novel would not have been so positive. Another important strength of this novel is its ability to transcend the simple and largely stereotyped love story drama. Though the main plot is focused on the love “square” between Bathsheba, Gabriel Oak, William Boldwood, and Sergeant Troy, the novel as a whole is about so much more. One can certainly choose to read this story as solely one of romance and drama; alternatively, it can also be interpreted as social commentary on marriage, gender roles, and the hierarchy of socioeconomic classes. Bathsheba cannot solely consider her own emotions when choosing a husband because doing so might put her social status or wealthy in jeopardy. This complicated web of nuanced details that goes into these relationships is the real brilliance of the novel, in my opinion. Despite the dramatic tone of the story, Hardy nevertheless presents a more realistic view of everything involved in forming a marriage during this time period. Flowery without being over the top. Simple yet powerful. Perfect. Though the ending was fairly predictable, this novel hardly left my grasp until I had completely finished it. Why? Because Far from the Madding Crowd is incredibly emotionally gripping. I became especially attached to the goodness of Gabriel Oak and his determined loyalty to Bathsheba, even though she often showed him little kindness in return. Despite my frustrations with her, I eventually found myself becoming attached to Bathsheba herself. After all that she went through, I couldn’t help but want the very best for her in the end. I think that much of this attachment and emotional suspense comes from excellent character development and the way Hardy makes all of these characters decidedly human and flawed. There’s a degree of familiarity here that is somehow reminiscent of one’s own relationships and experiences. 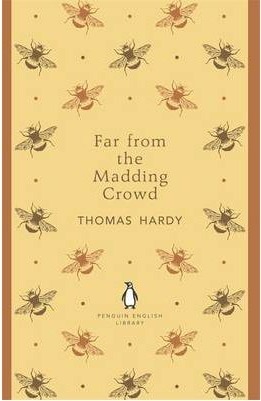 Overall, Thomas Hardy has converted me into an eager fan of his work with Far from the Madding Crowd. Whether you’re looking to read a love story or simply an expertly woven tale, I highly recommend reading this account of Bathsheba’s struggles. Would I recommend it to a friend? : Absolutely!! Have you ever read this book before? What are your thoughts on it? Have any recommendations of other works by Thomas Hardy that I should read? Let me know in the comments section below! I am glad you picked this one up. And I am even more glad that you enjoyed the read. I have read it several times and would love to read it again. I always thought this was some sort of war story. I don’t know why. And I actually have two copies of it! I’ll have to pick one of them up soon. Thanks for this review! I have a goal to read 40 New for me books before I turn 40 in 2018. This one just made this list! I love Thomas Hardy but I’ve been putting off FFMC for a while. I need to move it up the TBR list, it seems. By the way, I love that cover. So pretty. Love this book and the movie. Oak is my favorite character. Great review! I haven’t read any Thomas Hardy, but you’re making me rethink that decision! I love this book and the quote you picked out is one of my favourites. I read all Hardy’s major novels a couple of years ago and this is definitely the most enjoyable; I really like Bathsheba (maybe because I am not very likeable either and I relate!) and Gabriel is my number one book husband. Excellent review! I’m glad you liked this too. I am half-way through reading and reviewing Hardy’s Six main novels and he keeps surprising. I guess when people think ‘love stories’ they think of the romantics, whereas Hardy is firmly in the realists and the tragedy of his love stories only grows. I just read this and I didn’t know how to feel! I couldn’t tell if it was feminist or to (I guess it was revolutionary for it’s time) and I was generally very intrigued by the characters and social commentary.